When Ken first started teaching yoga he realized he was spending time preparing and teaching his physical yoga classes. Plus he was spending time learning and understanding the rich lessons which yoga had to offer. All of this while working long hours managing and growing a national technology company. Ken realized most yoga classes rarely even mention the rich spiritual lessons yoga has to offer. He also knew most of his students were also working long hours. And that his students would not or could not spend more time to learn and understand the rich lessons yoga has to offer. So Ken searched for a solution. What he decided to do was to start weaving the rich spiritual yoga lessons into the physical classes he was practicing and teaching. At first it was very awkward. Once he figured out how to weave the yoga lessons into the physical classes his students soon wanted more. The deeper ken went into the spiritual lessons of yoga, the more his students wanted. He decided to go deeper in his practice and started teaching what he had learned. So in 2007 Ken Heptig created GoalYoga™. Everything in life starts with a goal. Your personal yoga practice starts with your personal yoga goal. Even If you want to achieve peace, greater health, more happiness, a calm mind or anything else you still start with a yoga goal. 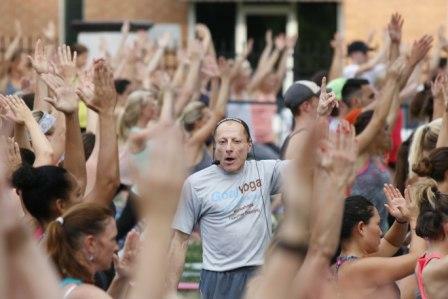 Ken Heptig has been teaching yoga and fitness classes since 1992. He has taught at private studios as well as 9 YMCA’s. Ken has been a dedicated runner competing in marathons and shorter races. His initial yoga practice was Anusara Yoga including training with Anusara founder John Friend and his top teacher trainers. Ken’s Yoga Alliance Certification was from yoga author and trainer Rolf Gates. Nine years ago I got that push over the edge. It was Monday night and the yoga teacher was a “no show”. I was super stressed from work and needed to practice. So with no teacher training or preparation, but with max adrenaline, I stood up and taught the class of over 50. I really wish I had a video of that class.